Since JN0-1300 exam retired on 8/15/2018, JN0-1301 is the new exam for Data Center Design, Specialist (JNCDS-DC) certification. Juniper JN0-1301 exam verifies the networking professionals and designers’ understanding of data center network design principles, which verify the intermediate knowledge of data center network design, theory, and best practices. Choose new Data Center Design, Specialist exam JN0-1301 dumps to prepare for your exam well. 1. You plan to deploy a set of SRX Series devices in an active/passive chassis cluster with an active/active network infrastructure. A. This deployment scenario is recommended when firewall services are used extensively for north-south traffic. B. This deployment scenario is recommended when firewall services are used extensively for east-west traffic. C. End-host traffic is serviced through one SRX node during non-failure conditions. D. End-host traffic is serviced through both SRX nodes during non-failure conditions. 2. Click the Exhibit button. Referring to the exhibit, what must you change to make the topology a supported Virtual Chassis Fabric design? A. Change the Routing Engine to a line card. B. Remove one leaf node. C. Add a second spine node. D. Change one of the line cards to a VCP master instance. 3. You are designing an IP fabric using EVPN with VXLAN and must ensure that all links between the leaf and spine nodes are used as efficiently as possible. A. Load balancing is automatic in an IP fabric design. B. Load balancing must be managed by an SDN controller in an IP fabric design. C. The overlay network needs to support load balancing. D. The underlay network needs to support load balancing. 4. You are designing a Control-based SDN overlay network. 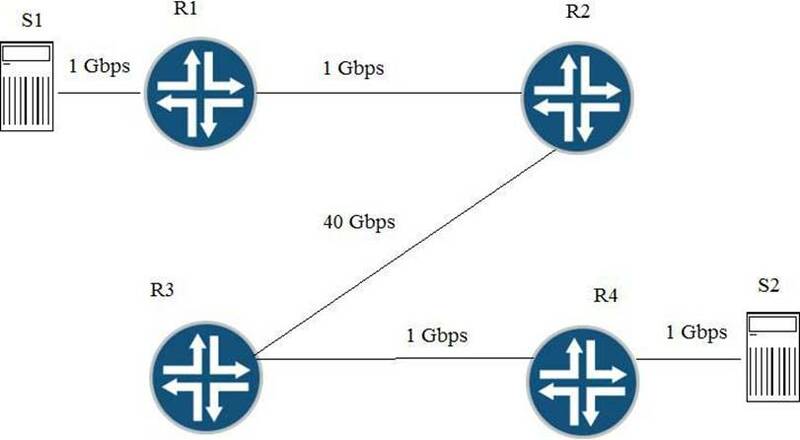 IP filtering and tenant separation for Layer 3 and Layer 4 traffic is required for this installation. In this scenario, which Contrail component performs this function? 5. You are implementing traffic prioritization in your IP fabric. You must ensure that traffic is handled correctly throughput the fabric. In this scenario, which statement is correct? A. You should implement a BA classifier on all egress interfaces on the leaf devices. B. Rewrite rules must be applied on the spine devices for all leaf-facing interfaces. C. You should implement a BA classifier on all egress interfaces on the spine devices. D. Schedulers should be applied to all egress interfaces on your leaf and spine devices. 6. You want to provide Layer 2 connectivity to a backup data center or to a disaster recovery site. What would you use to accomplish this task? 7. You are creating a design proposal and deciding whether to use 10 GbE copper or 10GbE fiber cabling to connect your ToR switches to the servers. Which statement is correct regarding this scenario? A. Fiber has a lower power consumption on a per-port basis. B. Copper cabling requires special transceivers for different speeds. C. Fiber is much cheaper to purchase but has a higher long-term cost. D. Copper will allow you to reach the greatest distance between devices. 9. A customer has selected QFX5110 switches. The initial installation will contain two switches located in racks about two meters apart. What is the most cost-effective way to interconnect these switches? A. Use SMF between the racks and interconnect the switches with LX4 transceivers. B. Use a Virtual Chassis cable between the VCP cards. C. Use MMF between the racks and interconnect the switches with SR4 transceivers. D. Use a three-meter passive DAC cable between the racks and interconnect the switches with it. A. IP-based applications do not require an overlay network to maintain connectivity. B. Applications that require security needs an overlay to provide the security. C. Applications that require Layer 2 adjacencies require an overlay network to maintain connectivity. D. IP fabrics can natively support both Layer 2 and Layer 3 applications. 11. Clos architectures are based on which network topology? 14. You are designing a Layer 2 fabric implementation for a small data center and have chosen to implement a Virtual Chassis Fabric. You must accommodate two racks of servers with 1 Gbps connectivity, 10 racks of servers with 10 Gbps connectivity, and maintain a single management interface. Which device would satisfy the requirements in this implementation? 15. You are implementing a new financial application in your data center. You must ensure Web traffic to this server is secure. Which Junos feature would you use to accomplish this task? 16. Your data center uses a Virtual Chassis Fabric. The ToR switches have 48 ports and each rack supports 20 servers. Each server has two ports that are configured as a LAG. You need to implement link level redundancy but you cannot use two ports on the same device for this redundancy. Which type of connection should you use to complete this task? 17. Click the Exhibit button. Traffic congestion is noticed when sending traffic from S1 to S2. You must design a CoS deployment to address the traffic congestion issue. A. You should use BA classifiers on R1. B. You should use multifield classifiers on R2, R3, and R4. C. You should use multifield classifiers on R1. D. You should use BA classifiers on R2, R3, and R4. 18. Click the Exhibit button. Referring to the exhibit, you want the vSRX device to inspect inter-VM traffic. A. You must put the connections between the VMs and the vSRX device in separate VLANs. B. You must put the connections between the VMs and the vSRX device in separate vSwitches. 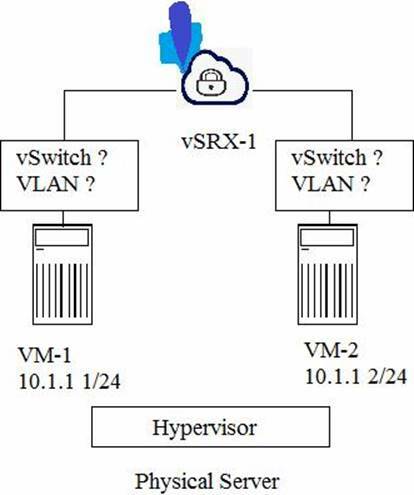 D. You must put the connection between the VMs and the vSRX device in the same vSwitch.